This is what Hannah and Holly do most days---only usually they are stretched out flat, sleeping after a night of patrolling and, lately, barking. (It's difficult to sneak up on them to take their pictures when they are sleeping. They always wake up.) The past several nights it seems as though they have barked all night and have been unusually close to our bedroom windows. Most nights I don't really hear them, or if I do, I'm able to go back to sleep. In a way, it is very comforting to hear them doing their job. I don't know if it's because I'm tired from the holidays or what, but I haven't been able to tune them out the last two nights. I'm more conscious of the barking when we have house guests, as we have lately, because I worry that it is bothersome to them (though almost without exception, everyone says they don't hear the dogs). I'm never able to nap during the day (I just can't fall asleep, unless I'm sick), but I sure wish I could have today. Maybe we all just need to get back into our "normal" routines around here. I've been thinking today about whether to make any resolutions for the new year. In a way, it seems futile to think of making major changes in my life. Honestly, there aren't any drastic changes I would want to make. I just finished reading a book (and not a very good one) about a woman who gave up a different thing for one month for a year. Not a lot of it could be applied to my life. She gave up taxis one month, cursing for one month, coffee, television, shopping.......you get the picture. The thing that should apply to me was the discipline it took to do that. I need that. Order, organization, simplification-those are the goals to set for myself in 2009 and I want to be a more positive and thoughtful person. To accomplish any of those goals, discipline is needed, so maybe the only resolution I need to make is to be more disciplined. Are you making specific resolutions or setting goals for yourself? I'd love to hear what you're thinking. The last few days (or weeks, actually) have been somewhat of a blur and this evening marks the end of all the official celebrating and the beginning of my sit down, relax and get back to my knitting time. We've had family here from near and far and a good chance to catch up with the goings on of everyone. Every holiday I struggle with being able to relax and enjoy instead of stress and agonize. I keep thinking if I can just get better organized, it will go easier. And it does, mostly, but I'm a long way from where I want to be. Maybe, (I always think) I'll have it all together next year. Guess it's good to be optimistic. One of the best things to happen in the last few days was a hike my husband and I took on Christmas afternoon. We decided to hike down to the creek that runs from the back of our farm and it was such a reminder of all the good things about where we live and how lucky we are to live here. We can walk out our back door and in 5 minutes be in a totally different world. Why we don't take the time to do it more often is beyond me. One of the things about living on a farm is that the list of chores never ends. There is always some task we could be working on and the challenge is to take time to enjoy our life, without becoming completely worn out by it. I'll confess that I had to be persuaded to go along yesterday because I thought I had too much to do to get ready for the family get-together today. Once we were down in the creek, all the to-do lists just floated out of my head. It was a wonderful little stretch of breathing space. I'm confused about what day of the week it will be in the morning, but I really don't think it matters. My plan for tomorrow is to feed my animals and knit---period! I hope you all had just the Christmas you were wishing for this year! It actually came! The snow actually came as predicted last night. Also, some sleet and freezing rain, which we could have done without. Feeding time at the barn this morning was pretty funny. For my "teenage" sheep (see previous post), it was their first glimpse of the white stuff and they were clearly baffled, as was Pippi. They quickly got over the shock and starting running in circles, kicking up their heels and jumping in the air. Wish I had been able to capture it for you to see. Then, as usual, their main concern was when breakfast was coming. My husband stayed home today because our farm road is treacherous in this kind of weather. It is one quarter of a mile long, down a hill, across the creek and up a hill on the other side. If you happen to slide off the road, it could be a while before you came to a stop. When I walked out this afternoon to get the paper and the mail, I could see lots of little rabbit prints and a few deer tracks, but otherwise, not much had been stirring. I made butternut squash soup for dinner tonight, using squash from the garden. I found the recipe a few months ago when I was in the throes of purging my magazine collection. It was in an old Organic Style (no longer published) and is definitely a keeper. I also made that oatmeal whole wheat bread yet again. It has become a real favorite around here. It's easy to whip up on short notice and is great warm from the oven and then toasted for breakfast the next day. In a way, I needed this day to ratchet down some of the pressure I'm starting to feel about not being ready for Christmas. On the other hand, you could say it's been another excuse for procrastinating a little longer. In any case, my "snow day" is coming to an end and tomorrow means back to the real world. ps-I had the name of the magazine wrong. It is Organic Style and not Organic Life and in a strange sort of coincidence, Susie Quick, the woman I've been sharing some Saturday Market time in Midway with, was the food editor of that magazine. I never cease to be amazed at how small the world really is! (Title courtesy of my friend, Kim.) Kim came out Sunday afternoon to take some pictures of a few of my girls and they were not as cooperative as I had hoped they would be. Kim is knitting a striped hat for her nephew with wool from several members of my flock and she likes to send along a picture of the animal(s) who produced the fiber. Her nephew is 7 or 8 years old and he likes knowing where things come from. Don't you think that is so great? Last year, another friend, Sara, was the shepherd who raised the contributing sheep for the Christmas hat (Beanie Baby-such a cute name!). Apparently, the nephew was so proud he took his hat and a picture of Beanie Baby to show-and-tell sessions at school and church. Don't we wish we could all knit up a gift that would be so well received? Sunday was dry, windy and quite warm (upper 50's). The ewes were way up in the top of a field and completely out of sight. I had hoped to just call them in, but the wind was gusting strongly--the wrong way. I can yell really loud, but they couldn't hear me, so we walked up to get their attention. Sure enough, when they saw us, they were pretty sure treats were on the way. I had a bucket of grain with me and it nearly caused a stampede. Of course, once the grain was gone, they were ready to turn their attention elsewhere. Most of these girls were among the last lambs born before the yarn shop opened and they didn't get much hands on time from me. Out of all of them, Pauladeen was the one who came when called and was happy to follow me around. She died during the summer and the rest of these girls are a bit of a hard sell for socializing. This year's lambs are a completely different story. (Remember all those bottle babies back in the spring?) Those ewe lambs are in what I call the "teenage phase". They are just plain silly sometimes--flighty, goofy and so much fun! They hang around me all the time and are always looking for a scratch under the chin or behind their ears. I have to admit, I love that. Saturday I spent the day in Midway, which is a wonderful village here in Woodford county. It was the day of their Christmas Open House and all the shops were decked out for Christmas. I set up my little display in the Honest Farm Market and was pleasantly surprised to sell quite a few of my hand knitted mittens, hats and Christmas ornaments. If I can manage to get a few more knitted this week, I may go back next Saturday. Susie, who owns the Honest Farm Market, had wonderful baked goods and beautiful arrangements of greenery and holly. It was a pleasant way to spend the afternoon and I managed to get in some knitting time, too. My impression was that people were looking for smaller and more personal gifts this year. I know the economy is in a worrisome state, but I think it would be a good thing if we could all think smaller and more personal, not just this year, but always. We have a winter storm warning on for this afternoon and tonight and I am so happy about it. I'm off to the grocery right now to get cookie making supplies. The annual Christmas baking marathon is about to commence! That would be in the state of denial. The whole time I was knitting the right front of this vest, I would stop and look at it and think to myself, "well, the pooling is just barely noticeable. I'll just keep going and when it's all put together, no one will even see it". Oh, the lies we tell ourselves (or maybe it's just me who does that). Right up until the moment I looked at the picture I had taken, I had convinced myself I could get away with leaving it. I've ignored it for several weeks now and it still has not corrected itself. Sometime after Christmas this thing gets a do-over. I love the yarn. It's one of the Briar Rose skeins I bought at Knitter's Connection, in Columbus, back in June. The vest pattern is really cute and easy and fast (if you don't mess it up so that you have to make it twice). It's from Rowan's Colourscape Chunky Collection. The pattern calls for Colourscape Chunky yarn by Kaffe Fassett which is lovely, but rather expensive at $23.95 per skein and the smallest size calls for 4 skeins. One small success story is this purse. 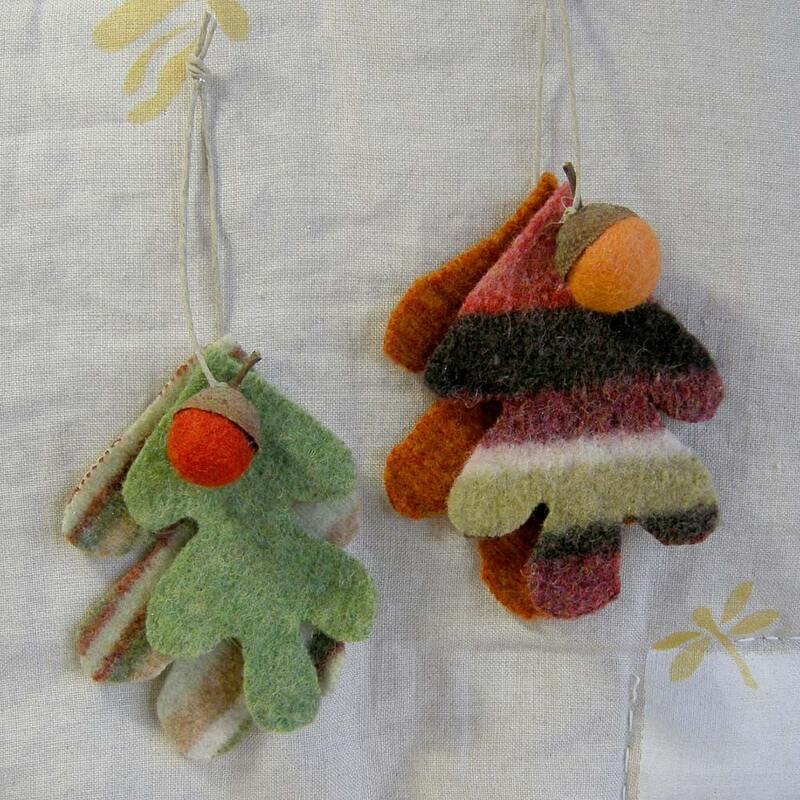 I knitted and felted it many, many months ago. Finally got the handles and closure flap sewn on a while back and will hopefully finish the lining this week. The pattern for the purse is from the Pursenalities book. The fabulous leather handles were purchased two summers ago in Napa Valley at a knit store in St. Helena, Muse. (I have seen them advertised in some knitting magazines.) I bought two pair even though at the time I had no idea what I'd use them on. The yarn I used is some of my own handspun, hand dyed, plus some handspun natural colored charcoal gray for the bottom and trim around the closure flap. I'm not sure about the button at this point. It's not really necessary because there will be a magnetic closure under the flap. I'm pleased with the way this turned out and think I will actually use it a lot. The Christmas knitting is not going so well this week. Revisions are under way. Thanks, Kristin, for the great crafting idea! Two of my grandsons were here over the weekend and we spent a lot of Saturday building our own versions of Kristin's birch bark houses. We don't have birch trees around here, so after some thought, we went down to the creek and searched until we found enough sycamore tree bark to do the job. If I had been planning ahead a little better, we could have found it easier before the snow covered the ground, but we managed to find enough to see us through the first round of this fun project. Ours are pretty rustic compared to Kristin's, but maybe are more suggestive of a Kentucky cabin in the woods. One thing I discovered about crafting with a 13 year old and a 10 year old---someone in the group had a real love of the hot gun glue! (Next time I need to buy way more glue sticks.) These are what we ended up with and I'm ready to make more, if I can squeeze in the time. These next few weeks are going to be pretty hectic around here. If you have a few hours and are feeling creative, give these little houses a try. One of the best parts is taking a walk outside and trying to think of ways to use all the supplies nature is providing at this time of year. I'm thinking I want to make a village now and my husband has suggested a "model" of our own farmhouse. Not so sure I'm ready to tackle that one yet, but I do think I see a barn taking shape. ps-sorry about the weird layout. Blogger and I cannot agree on picture placement this morning and, so far, Blogger is winning! We've had a problem with uninvited guests since a few days before Thanksgiving. These folks just started showing up early in the evening and then they just help themselves to food meant for others. Thankfully, they did not come by on Thanksgiving. I guess the fact that there were so many cars parked in the drive was a little intimidating. Thank goodness. Well, they haven't actually come inside and made a place for themselves at the table, but nevertheless, this is a difficult and uncomfortable situation and we are just not sure how to go about solving the problem. These folks have a pay-back technique that leaves a lasting impression! Sorry, I just couldn't help messing with you a little bit. That's just one of our uninvited guests grazing beneath the bird feeders. I feed black oiler sunflower seeds to the birds and I guess the skunks really like it too. There are at least two of them that have been showing up and staying for an hour or more nearly every evening. This is not a good thing. It is a miracle that I haven't accidentally walked too close to them. I often go to the barn after dark and sometimes don't remember to fill the bird feeders until late. Needless to say, this is a delicate situation and I'm afraid the eventual outcome is not going to be favorable to the skunks. They are kinda cute, but not cute enough to risk my being rendered unfit for the company of others through the holidays. Thanksgiving was great. Way too much food, a house full of relatives and then the usual collapse on the couch in front of the fire. Now, Christmas is coming at a gallop. Thanksgiving was later than usual this year and now it is just a little over 3 weeks until Christmas day. The Christmas knitting list may undergo some revision if I don't get really busy this week. Which seems to me a perfectly good reason to build a fire and settle on the couch to watch "A Christmas Story" (for about the 50th time, but I never get tired of it) and put in some quality knitting time. I have begun my countdown to Thanksgiving dinner. The first of the pies are baked, the jam cake is iced and in the pantry and one of the turkeys is in the brining mixture. I've baked the biscuits and cornbread for the dressing, made the cranberry relish. I'm thinking hard about how to have our Thanksgiving meal on the table at the appointed time. Every year it ends up being about an hour later than I said it would be. I'm a pretty experienced cook, after all these years, but still have trouble getting everything synchronized to be ready at the same time. Especially a meal as big as Thanksgiving. I think about trying to eliminate some of the dishes, just to simplify things, but that idea is always nixed by family. Especially this year, it seems maybe too extravagant to have so much. On the other hand, I am more aware than ever and grateful for the abundance in my life. Not just food to put on the table, but a family that is healthy and happy, the new baby that will become part of the family in January, a life that is busy and productive and allows me some time for creative activities. It is so easy to fall into the habit of complaining (I'm speaking of myself here) because things are not just exactly the way I would like sometimes, but when I stop and look around, I know that I am blessed. Barn chores don't stop for the holidays. I've been feeding twice daily since back in the fall because of the drought, though we have had some rain lately and the grass has greened up a little. Some mornings I can hardly make myself put on the coat and boots and hat and gloves to go to the barn, but once I'm there, I end up staying longer than I really need to, just observing and interacting with the animals. There's no doubt, life would be so much easier without them, but also, maybe not as interesting. I mean, look at that face. How could I wish he was not here? There's always a trade-off. Of course, in the midst of all the cooking, I really want to sit down and knit. I started one of those scarves and it is the perfect "pick up and put down" project. No patterning, no increasing, decreasing, cabling, just two rows in one color and two rows in the other---and short rows, at that. Love it. And I love it (please don't hate me fellow Kentuckians). We even had a few wisps of snow yesterday and last night. It's about time, is what I say. Thanksgiving is next week. Yikes! Yesterday I went to the grocery and bought most of my Thanksgiving supplies, though I never seem to accomplish it all in one trip. At least this year, I've given myself some extra time to get a head start. I love Thanksgiving and having everyone gather at our house. It is usually several tables full and because there are still so many young children, it is also loud! I'm always collapsed on the couch in front of the fire by evening, but wouldn't trade it for anything. I wrote the above paragraph much earlier this week and have been unable to get back online since. I am not very computer literate and am fully prepared for any problem to end up being my fault due to ignorance. This time, though, it was not me. As I have said before, living in the country is great, but there are plenty of compromises involved. One of them is that technology is slow to get here and often doesn't work right. That is my DSL connection in a nutshell. This week it has not worked. The first few days I though it was just the normal malfunctioning. When I got fed up enough to call Windstream, they sent someone out and he (bless his heart) cheerfully replaced my modem and (crossing my fingers) so far, that seems to have done the trick. And here is some great news for those of us technologically challenged and who frequently need help, Windstream has replaced it's help centers in India and you can actually talk to someone in America now. They even have a recording telling us that, "you talked and we listened". Amazing! Meanwhile, I have had a rash of finishing stuff. I finished some fingerless mitts, a vest (still need to put the button on, then I'll post a picture) and a pair of heavy barn socks that have been around forever. Now I have been bitten by the scarf bug due to reading the Yarn Harlot's recent posts and my friend Lindy showing up at Wednesday knitting with one she made using Silk Garden and some of her dark gray alpaca yarn (and I just happen to have some of both). I'm thinking these might be really good Christmas gifts, depending on how fast I can crank them out. I'm casting on today. Miss Pippi was puzzled by the snow this morning. Wish I'd had the camera with me when she came out the barn door. You could almost see her brain working on what this stuff might be. We are gearing up for the holidays around here. Even the chickens are cooperating by producing a dozen eggs daily. (People are starting to back away when they see me coming with the egg cartons!) Right after Thanksgiving the cookie baking starts in earnest and plenty of eggs will be used, though even I can't use up 7 dozen a week. So, here it is Friday evening again and I'm wishing for you to have a good weekend. Who knows, maybe I'll be back before next Friday, if the internet is truly mine again. Am I the only person around who buys magazines she can't even read, just because the pictures are so fabulous and inspirational? I subscribe to Marie Claire Idees, though I cannot read a word of French, because it is always full of wonderful projects. Often, I can guess at the meaning of a word and sometimes even decipher some of the directions. Oh, how I wish they would include an English translation so I could actually read it all. I love how they always have wonderful things made from linen-lovely natural colored linen. And there are always projects made from wool. The latest edition came today and has such great ideas for Christmas knitting and crafting. There's a whole article on holiday decorations using pom-poms! (C'est le Pompon!) I might as well confess to being somewhat of a magazine addict. I recently went through a huge stash of magazines and made myself donate them. I have years and years of the British edition Country Living (I'm not ready to let go of those!). Whenever I'm in a bookstore or grocery, I check out the magazine racks to make sure I don't miss anything! I am trying to be more selective about the ones I bring home. I thought there would be a picture of my finished Jo Sharp "everyday sweater" to show today, but you're getting an almost finished picture instead. I actually wore it to Wednesday knitting, but decided it needed a partial do-over. It has a rolled neck and is supposed to be the same on the bottom and the sleeves, but I didn't like the roll at the bottom, so I knitted a turning row and knitted a hem. Didn't like that either. So, I have cut a stitch, detached the hem and have picked up the live stitches and am knitting downward on a knit two, purl two bottom edge. I sure hope I like this version. The bottom edge is starting to get some mileage on it already. The Wednesday knitters decided this sweater is just about as good as your favorite sweatshirt for comfort. Now that I have the bugs worked out I'm thinking about starting another. I used Jo Sharp Silkroad Tweed Aran in Brindle (it's more interesting than it appears here). It was knit from the neck down, has raglan sleeves and is an easy, fast knit. Not the most exciting sweater I've ever knit, but I'm thinking it will be worn a lot. The weekend is here and we might have snow flurries! (That makes me unreasonably happy!) I hope your weekend weather is just what you're wishing. Today has been cool and windy and put me in the mood for warming foods. I've had the new Ina Garten cookbook, Back to Basics for more than a week and haven't had a chance to try anything, until today. Ina's books are the first ones I pull off the shelf. She never let's me down. I don't think I have ever prepared anything from any of her books that hasn't been delicious and quite a few of her recipes have become my standards (turkey meatloaf, tequila lime chicken and key lime pie just to name a few). Today I made Italian Wedding soup and it is yummy! I make a pretty good chicken noodle soup, but this may be my new favorite chicken soup. I love the little spicy ground chicken and chicken sausage meatballs and having carrots, onion, celery and spinach in there almost makes it into a "health" food, right? I also made two more loaves of oatmeal-whole wheat bread from a recipe I got here. I made two loaves last Monday and they tasted great, but looked a little homely. I think I didn't knead the dough long enough. Today's loaves look better, but still seem a little flatter than I would have hoped. Next time I'll try slightly smaller pans. The only bad thing about me baking bread is that I want to actually eat it. I mean all of it! While working on the details for my Etsy shop, I may have done a little shopping. I bought this cute little SewBendy Henna Garden Knit Ditty. 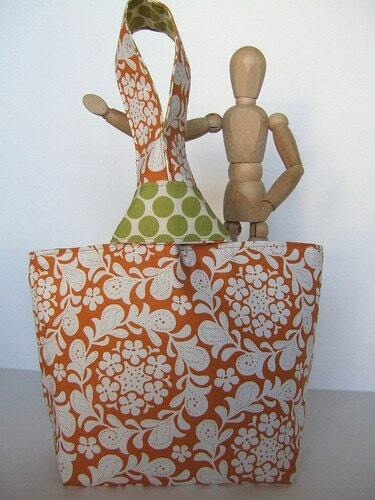 It is the cutest little orange print (had to be orange), lined with a green print and, as Susan has been saying, it is the perfect size to tote around a little project everywhere you go. And then I just happened to check out these from Betz White and had to add them to my collection of oak leaves and acorns. They arrived just a few days ago and are so cute! I think we are going to Cincinnati tomorrow to visit with my stepson and his girlfriend and make a run on IKEA. I'm hoping to get some shelving solutions for my so-called studio. It needs some real help in the organizing department right now. A little car trip mean some guilt-free knitting time for me. Yay! Hope this weekend gives you knitting time also. This has been a busy day right from the get-go. I woke up really early for me (five-ish) and kept going over my to-do list in my head until I finally just gave up and got out of bed. I thought I might slip out quietly and go vote at the volunteer fire station just up the road and beat the crowds. Ha! At 6:05 am the parking lot was full and both sides of the road were lined with cars and trucks. And the line was out the door and all the way across the parking lot! Wow! Never, ever have I seen so many people voting. I just turned around and came back home. I went back around 2 pm and only had to wait about 10 minutes, but the place was a constant stream of traffic. I love this---that so many of us are engaged this year and taking part in one of the things that makes America great. We have a choice and today many of us exercised that choice. The time between my first attempt to vote and actually voting was filled with quite an experience. Around 8 am, I loaded the three alpaca boys into the trailer and drove over to Seldom Scene Farm because Lindy had scheduled the veterinarian to come out to castrate some male alpacas this morning. It seemed like a good opportunity to get my boys done at the same time. Dr. Keith made the procedure look pretty simple and he was great with handling the boys in a non-stressful way. In the picture they are all feeling no pain (the towels over their heads are to prevent them scratching their eyes with straw while under the anesthesia). Stormy (the black one) took the longest to anesthetize. After this picture was taken, he woke up, stood up and then wouldn't go down again until he had been dosed several more times. The boys have been taking it easy this afternoon and don't seem to be feeling any the worse for the experience. I'm really glad to have this little chore out of the way. Prince has been feeling his oats lately and trying to assert his manhood! And, who is this? Someone else came home with us from Seldom Scene Farm. (Notice Strawberry's ears. She doesn't look very happy, but on further investigation, she changed her mind.) Grato stayed with us for a spell last year and gave us the lovely Pippi. Today he seemed a little spooked by the bells on the sheep in the next pasture, but eventually decided they weren't going to come after him and got busy on the task at hand! Like father, like daughter! Now you can really see where Miss Priss gets her good looks. Most mornings I go to the barn to feed and then do various chores and spend time with and observing all the animals. There are lots of mini-dramas happening all around. I caught a little stand-off in the back barnyard yesterday morning that reminded how far you can go if you have confidence in yourself. Sadie is a barn kitten who came home with me from my son's house a few months ago. She is one of the sweetest kittens I have ever been around and she is a tiny, little thing. She and her companion, Oliver (who came home with me a few weeks later----I know, am I a sucker or what? ), have settled right in to their role of working barn cats (in training). Oliver is a bit timid around people, but fearless around the animals and, though I didn't realize it until yesterday morning, Sadie is not lacking in confidence either. Sadie was in the back barnyard, playing with a feather she'd found on the ground and suddenly all three alpaca boys were surrounding her. Earlier I had seen one of the boys go after Oliver, so I thought maybe I should go out and rescue Sadie before she got hurt. She did not need my help, thank you very much! As soon as one of these guys put their nose down to smell her, she would give them a whack with her paw. The amazing thing is they backed off! There's a lesson there for all of us. Today is the picture perfect autumn day in Kentucky. It has been quite cool at night this week, in fact, down in the 20's, and we've been able to have a fire in the fireplace several evenings. I love that--the sight, the smell and the sound of a real wood fire. It's one of the the things I like best about cold weather. It looks to be a perfect weekend here in Kentucky. I hope it is the same where ever you are. Ah, the weekend....where did it go? Time always goes at fast speed for me and especially when I'm having fun. And I did have fun this past weekend. Saturday morning at 6 am, Sara, Kim and I met in the parking lot at Meijer and, after a breakfast fast food drive-through, we were on the way to the Southeastern Animal and Fiber Fair (SAFF) just outside Asheville, North Carolina. The 4 1/2 hours down passed quickly for me, but I will admit that all I did was sit and knit and talk. Sara ended up driving the whole time, both ways, so I got more knitting time than I was expecting. Once it was daylight, the drive was beautiful. There were many colorful trees, unlike here at home where the drought has turned everything brown. SAFF was much as I remembered it from the last time I went, years ago. Although it did seem to have a bigger commercial area, I thought the fiber animal show looked smaller. There didn't seem to be as many sheep competing, but there was a fairly large contingent of alpacas. It is certainly not in the league of Maryland or Rhinebeck, but it was a nice outing on a beautiful fall day. One of the best things about the trip, for me, was going in to downtown Asheville, visiting a terrific yarn store and eating dinner at a wonderful vegetarian restaurant, The Laughing Seed. The yarn store was Purl's Yarn Emporium and it was chock full of great yarns and books. I loved the eclectic decor and comfortable places to hang out. Even better was the attitude of the sales staff---so friendly and helpful. Dinner at The Laughing Seed was an experience in fabulous food and all you could hope for in good service. I would definitely recommend both places to anyone traveling in the area. Since I didn't do any driving, I did do some knitting. Did I finish up any of the many projects I took with me? Why no! I cast on for a new project, but one I've been wanting to make for a long time. I am knitting Eric's Glovelets from Green Mountain Spinnery I have had the pattern forever and am embarrassed to admit that I had not actually read to comments describing the pattern. I assumed Eric was a man and the glovelets were man sized, but I liked the design so much I was intending to change the pattern to fit me. Turns out, Eric is a designer and musician (woman) who lives somewhere close to the Spinnery. I have finished the first glovelet and am working on the second one. It's a pretty quick knit and would be great for Christmas presents. The baby cable pattern keeps it interesting and I am loving the mossy green tweed. I'm using 2 balls of Rowan Scottish Tweed DK (color # SH015) that I found in a sale bin on my last trip to Cincinnati. (It looks as though it will take about 1 1/2 balls.) I did lengthen them enough so that they came further down my fingers and if I knit another pair, I will make the thumb smaller. These are likely to become my every day mitts this winter. I have a new job skill to add to my resume of very specific, but not so useful skills. BIRD WRANGLER (definition-someone who spends way too much time during her day trying to get peafowl off the top of the barn roof, off the front porch, off the hay feeders, off, off, off........of, you name it, they've been on it.) It looks as though they have finally figured out the roosting deal and, as you can see, are all cozy up there with mom. We've never had peafowl chicks before(except Mr. and Mrs. Dandy, who were kept in with the chickens until they were adults), so their behaviour is pretty interesting to me. Frankly, I'm amazed at how Mrs. Dandy is still being such a watchful and protective mother. Today we had blessed rain all day long. This is the first good soaking rain in about three months. The picture shows the creek crossing we drive through every time we leave or come home. For many months it has been barely there, but today it is flowing again. I never, ever have a clean car for more than a few hours because of driving on a gravel farm lane and through the creek. This morning, I brought everyone up so they were either in the barn, or had shelter under one of the shed roofs. I know that is a little over-protective, but because it is going to get cold tonight, I didn't want them to be wet and cold. The sheep, especially, can handle the cold and usually prefer to be outside, but not if they are wet. The Bluefaced Leicester fleeces part right down the middle of their backs in the rain and they seem miserable. So, in they came and settled right down for an afternoon of snoozing with the sound of the rain on the metal roof of the barn. I love hearing the sound of the rain and of the animals quietly resting. It inspired me to stay in my work room in the barn and spin up some roving I recently dyed. I'm in the process of taking pictures and setting up a shop on Etsy. (I need to develop actual useful skills for this.) I have only been selling my yarns and roving locally, but Susan Anderson has given me the encouragement I needed to extend myself a little and see what happens. I have spent the last hour or so sorting through knitting projects to take on the road tomorrow. I'm meeting two friends at 6 am and we are driving to the Southeastern Animal and Fiber Fair, just outside of Asheville, North Carolina. Driving down and back----tomorrow. That's 9 hours of road knitting time. Actually, since there are three of us, and if we take equal turns at driving, it is 6 hours of knitting time, give or take a little for eating and other necessities. I am definitely up for a little road trip. I was so disappointed to miss Rhinebeck this year, but am planning on next year already. So, I've settled on socks, a scarf, a nearly finished sweater and there's the outside possibility I may cast on for some mitts. Well, you know, I might get tired of working on just one thing. It's good to be prepared! Wherever you are, have a great weekend. I'll be back soon with a full report on SAFF. She's growing, our girl. The last time I tried to pick her up, it was a bit of a struggle. I love watching her interact with all the other animals. She's pretty confident and that's what we want her to be. Around here it works out better if everyone is pretty much bomb-proof and, if they are born here, it usually works out that way. We have so many different animals here to be exposed to and there is always something causing a ruckus, so most get used to a lot going on right from the get-go. Anyway, we think she is pretty cute and are really enjoying her. Ever notice how a baby of any sort just grabs your attention? I think that is one of the best things about being on the farm. New life happening all around. Of course, the down side is that animals grow old, or get sick and die, but even that is a life lesson. The cycle of life continues. ....or lack thereof, as may be the case with these peachicks. When I went to the barn to feed this morning, I only saw one peachick walking around with the mother. I searched high and low, walked the fields, accused poor Holly of bad deeds and finally gave up. I had just let the chicks out of the dog kennel three days ago and had been watching them closely to see that they stayed close to the hen. Mrs. Dandy is pretty vocal and aggressive if anything seems to get too close to the chicks, so I thought, given their size, they were ready for freedom and life around the barn instead of being contained in a 12 x 12 dog kennel. I know, given the size of their little peachick heads, there can't be much gray matter contained in there. When I finally looked up---I mean really up, there they were......huddled way up there on the barn roof in the pouring rain. They looked completely miserable, but there's not much I could do, except hope they fly down sometime soon. At least now I don't have to worry that they are not strong enough to fly up in the rafters of the barn to roost with the adults at night......that is, if they can figure out that they need to be inside the barn to fly up to the roost. We have finally, finally gotten a nice, slow rain this morning and the temperature has cooled down significantly, which is such a relief. We need to have at least a little real fall weather before winter sets in around here. I keep hearing all these folk methods for predicting a bad winter. There's the woolly worm theory and the number of berries on the holly trees and how thick the animals coats are getting. I don't know about any of them being true, but (and I may live to regret saying this) I hope we are in for a real winter, with the ground frozen and some appreciable amounts of snow. I say, "Bring it on!"